Dance, dance, dance! The new Quadro Dance HUDs from Animazoo is packed with original dance animations and so many features to make dancing in Second Life fun and easy! I have been playing around with both of the HUDs — the Quadro Ladies Dancefloor Edition, and the Quadro Stage Performer Edition. Each HUD is packed with 35 of Animazoo’s bestselling dance animations in various dance styles perfect for hanging out at the club or performing on stage! For the videos below, I recorded more than 40 minutes of footage cos the HUD is packed with so many dances, but I edited them into two short videos. The video probably shows only 10% of the dances that are available in these HUDs, so definitely visit Animazoo and try it out for yourself! 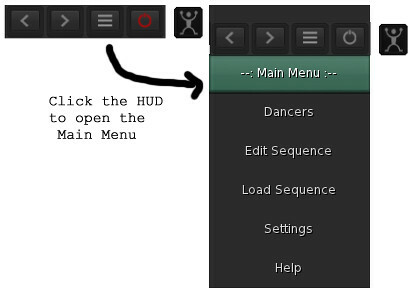 The Lite version of the Dance HUD (has basic features only) is also available at the store for free, and you can put your own dance animations into it. Do you love to dance? What’s your favorite shop for dance animations? Leave me a comment cos I’m looking for new ones to create new dance sequences for my HUD! In the meantime, I am going to hit up Animazoo, thank you for posting this and the fantastic job on the videos and tunes!! YAY! Hi Laila! I wore my physics for a tiny lil’ bit of bounce 🙂 Good eye! Didn’t think anyone would notice! MyAnimations have some really good dances, but they have a major issue – sometimes they disappear completely from the inventory after paying for them, the money isnt returned, and the manufacturers wont refund for it. Put me off that store majorly! Suddenly very glad I didn’t buy any of their animation packs as I thought about doing a couple weeks ago. Oh yes for “Super Bass” background music lol. Ahem, I’m a total Nicki fanatic so this was very fun for me to listen to :). But, I quite like the anims. Very nicely done and fluid to me. Can’t say I have heard of this particular hud, so just you saying it’s packed full of dances let’s me know I’ll be checking them out. Haha, how cool is it to see your shadow too! A&M Mocap Animation Workshop has some good dances, especially their belly dances. I’ve purchased quite a few. You can find them on marketplace or in world. https://marketplace.secondlife.com/stores/70725 they also have several other styles of dances etc available. I know you have a windlight tutorial but I couldn’t help but admire your nice shadows in your videos. May I ask what windlight setting you use to get such nice shadows and still not look like you’ve been overcooked in the sun too long? Great post! Love it, looks great! I tend to like the dance animations from Henmations. I am on my way to check this out in world now, but love the little videos! So adorable. Fun group – loves to share lots of information… New animation shops, dance sequences, reviews of dance related things – so many different pointers there. Cheerleading animations came up yesterday. They have demos of dance sequences and tutoring sessions on specific items to help dance. Just seeing the list of dance animation shops is very handy – makes finding lots of interesting styles easy – from any dance style, to mermaid dances to cheerleading… Lots of very helpful people in the group who are very glad to try to help. If you want to learn about dance in SL – the Dance Queens group and website really help a lot. May I ask what program you use to record video in SL? I am trying to learn how to do that and asking around to find the best program overall. I use a program called FRAPS to screen capture for my videos! This is absolutely adorable and you look great in these vids, but I have to ask, where did you get those shoes?